Home Kids Room Decor Fun Kids Themed Rooms Camo Bedroom Decor Army Men Room Accessories! 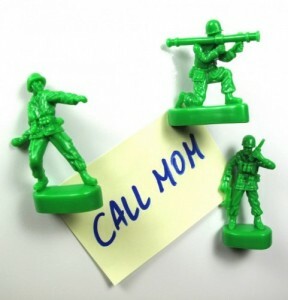 If you’re tricking out a kids military room or even a camo inspired room then army men are the perfect accent. They’re a classic staple in every kids life & these room accents are pure nostalgia. If your kids hang posters or have a memo board then these push pins will surely be a fun accent to their room. You get a set of 5 different guys that act as regular thumb tacks. As an added bonus…none of their friends will have them! Personally I’d get a couple sets of these guys to really fill out the memo board & make it feel custom. After you’ve finished reading Bravo Two Zero, Tinker Tailor Soldier Spy, End Game and Toy Story’s Mega Coloring-in Book, it’s time to put them pride of place on your bookshelf. 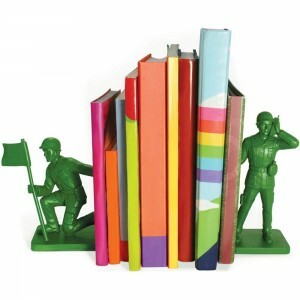 So what better accompaniment than these two brilliant Soldier bookends?! What sane person wouldn’t want these wicked bookends?! They are about 7.5″ tall & feature the classic look of the plastic army men…but they are made from resin. They cool little soldiers will keep those unruly books in order & standing up straight! This set includes both army guys shown. If you just need one bookend then get this guy Homeguard Soldier Book End will be perfect for you. 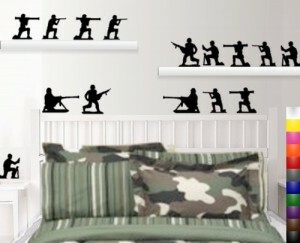 If your kids are into warfare…or army guys then these wall decals are great for adding a little accent to their walls, furniture, windows, mirrors or even school stuff. These decals stick to anything that’s smooth. They come in 11 different colors & includes 15 army men ready for battle! They’re easy to remove without damaging the surface so tricking out a room or locker will be super easy & fun! Halt! 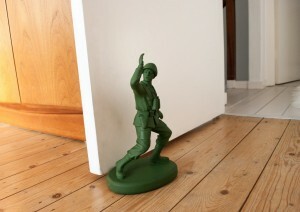 This classic doorstop features a detailed army man in the stop position. He’s really good at holding doors open & making a statement! The original Home Guard consisted of volunteers who, during World War II were unable to go to war. Despite this they stood strong against the threat to peace and harmony at home. Like Dad’s Army these resin soldiers will dutifully stay behind, determined to keep domestic peace against the menace of slamming doors. He’s made of a plastic poly-resin & Measures 6.5 by 11 by 4.7-inchs.